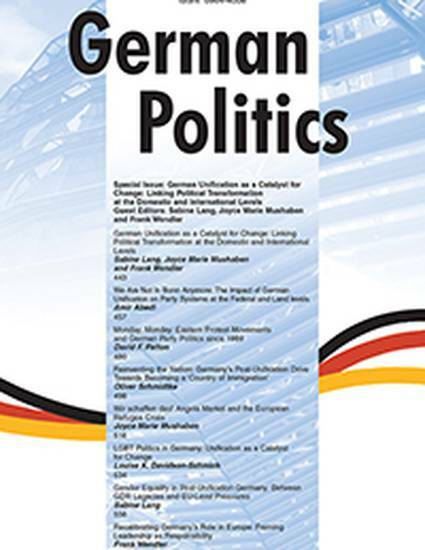 This article assesses the German party system and its development over time. Offering a systematic examination of elections at the national and sub-national levels and using a variety of qualitative and quantitative indicators, this article shows that unification has had a significant impact on party system development. While partisan dealignment among the western electorate and a lack of significant party alignment among eastern voters has led to converging behavioural patterns, there are still notable differences between the party systems in the two regions. The two parties that have dominated government formation at the federal level, the CDU/CSU and the SPD, still do better in the West, while the PDS/Die Linke continues to secure higher vote shares in the East. The FDP and the Greens consistently score higher results in the older states while the parties linked to the populist, radical, and/or extreme right have recently proven more successful in the younger ones. These differences are rooted in the distinctive voter bases of the respective parties and special characteristics attributed to the East German electorate.